For the next few decades, responsibility for leading the Supreme Court is likely to fall to John G. Roberts, appointed Chief Justice in 2006. How will the Court be transformed under his leadership as it confronts a vexing range of issues, from new technologies of human reproduction to new technologies for identifying and punishing suspected terrorists? 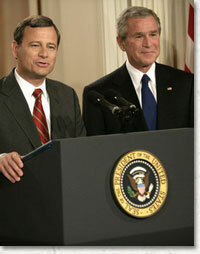 I met with Chief Justice Roberts in July 2006, soon after the end of his first term on the Court. In an exclusive interview for THE SUPREME COURT, the companion book to the PBS series, he shared with me his thoughts about his new job, including his judicial models and leadership style. In particular, Roberts expressed concern about the degree to which justices in recent years have acted more like individual law professors than members of a collegial court, and also about the way that the public focuses on the Court's narrowly decided decisions rather than on the far greater number of unanimous ones. Roberts looked to his greatest predecessor, John Marshall, for a model of how to unify a fractious group of justices, and said that he hoped to encourage his colleagues to decide cases narrowly rather than broadly, in order to foster as much unanimity and consensus as possible. And he suggested that Marshall's success was due not only to his judicial philosophy but also to his judicial temperament -- the conviviality, good humor, modesty, and moderation that led even his philosophical opponents to admire and respect him. By leading with a light hand, Roberts suggested, Marshall was able to remake the Court in his own image, and he suggested that he would try to emulate his greatest predecessor's example. Whether Roberts will be successful in his goals, of course, depends not only on his own temperament but also on those of his colleagues, and the degree to which all of the justices are willing to compromise and achieve consensus for the good of the institution. But history suggests that the more institutionally minded justices will be more successful over the long run than the brilliant loners and those who promote themselves and their agendas at every turn. The pragmatic Chief Justice John Marshall repeatedly outfoxed his more radically philosophical relative Thomas Jefferson, and this pattern has held for the past two centuries. The evangelizing civil rights crusader, John Marshall Harlan, had more dissenting opinions vindicated over time than the radical majoritarian, Oliver Wendell Holmes. The politically shrewd Hugo Black remade the Court in his own image, while his friend and fellow liberal icon, William O. Douglas, limited his long-term influence because of his self-indulgence and reluctance to persuade his colleagues. More recently, the pragmatic conservative William Rehnquist was more successful in winning over his colleagues than has been Antonin Scalia. In each of these pairings, which are examined in the series and which I explore in THE SUPREME COURT, it was judicial temperament -- defined as a willingness to put the interests of the Court above the interests of an individual justice -- that made the difference between success and failure. Chief Justice John Roberts has said that he hopes to encourage his colleagues to decide cases narrowly rather than broadly, in order to foster as much unanimity and consensus as possible. Above, Roberts with President George W. Bush at the announcement of his nomination to the Court, July 19, 2005.